This project is under the direction of Dr. Gregory Kline of Calgary, For We Care’s “Vice-President – Future MDs”. Dr. Kline is a Clinical Professor of Endocrinology at the University of Calgary and Medical Director of the Dr. David Hanley Osteoporosis Centre. He has also made a number of mission trips to the Mbingo Baptist Hospital. 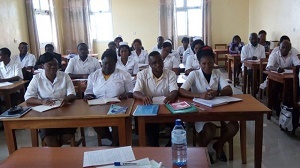 The FMASP recognizes that there are potential medical students among individuals working in African health centres who already have some basic medical training, either as a nurse or clinical officer or laboratory technician. Such persons will be younger aged and willing to commit to further, formal medical education provided they have sufficient pre-existing schooling to qualify for application. They will have shown excellence in their clinical work to date, as recognized by physician supervisors/co-workers. Provided the program criteria are met, and accredited medical school acceptance achieved, the FMDASP will fund the full course of training with the expectation that Program graduates will pursue post graduate training in the CIMS (or surgical equivalent) program prior to taking a position in a local health facility. At present we have one medical student, Joel, attending the University of Ghana Medical School (a four year program); who was employed at the Mbingo Hospital and will return to it upon graduation. This is a high quality medical school that has very competitive entry standards, receiving hundreds of international applications including many from North America. Joel was accepted into the program and has now finished his first year. Dr. Kline has been in regular contact with Joel over the year by email. It was a difficult and stressful year in many ways (a common feature of any medical school!) but Joel did well and Dr. Kline has received official notice from the university that he has earned promotion to second year with honours grades in some classes. He is living in student housing in Accra, Ghana which he says is extremely noisy. Dr. Kline sent him some noise-cancelling headphones during the year which he reported were very helpful for studying! At the end of his 4 year medical degree, Joel will enter the CIMS Internal Medicine Residency Program at Mbingo Baptist Hospital in Cameroon. Dr, Kline just returned from his 3rd visit to Mbingo himself and he is really pleased to report that there is tangible progress coming from that program. In particular, the program is now officially partnered with the Medical University in Yaounde. This is a big step forward in terms of gaining national credibility for the program and they have also inaugurated an on-site Baptist Health Institute which will be the research arm of the hospital and associated training programs. As a research and training-focussed institute, this place is poised to become a leading medical centre in west-central Africa. Dr. Klein cannot emphasize enough just how huge a step this is for raising the bar of health care training and delivery in Africa. The internal medicine residents are also progressing very well. Many residents are now taking on research projects in addition to their training. They actually get more scheduled teaching than our own residents here in Calgary and it certainly shows on the ward — for the first time, this year when Dr. Klein rounded in the hospital with the residents, some of them were willing to politely challenge him on issues of diagnosis and therapy. This is seen as an incredibly important and excellent development — the highest quality health care depends upon physicians being willing to think and professionally challenge each other for the purpose of coming to the best diagnosis and plan. Several residents have even chosen to pursue further training beyond the 4 year CIMS program - including oncology, cardiology and intensive care — for which additional training is available in South Africa or India. In order to continue these steps, it is crucial that we continue to bring the highest quality people into the programs. Whether in Africa or Canada, the best health programs succeed when they train the most motivated and skilled entrants. This is where the Future MDs of Africa Program comes in — we are effectively “building through the draft,” to borrow a term from the sports world. Funding for this project requires close to CDN $30,000.00 annually, per student, to cover tuition fees, relocation, travel, etc.